This package is for the couple who wants it all! We will cover your San Francisco City Hall wedding from start to finish and everything in between. Starting with Bridal Prep and then on to SF City Hall to cover your ceremony and formal photos in the building. With no time limit, you can be sure to capture all of the beauty of this amazing building and still have time to include photos of family and friends. We then travel to the San Francisco locations of your choice (as many as you want)! Our coverage is not complete until all of your wedding reception events have occurred, including cake cutting, first dance, and bouquet toss. For those future brides and grooms who truly prefer candid wedding photography, this is the package of your choice. We will creatively cover all of your wedding events and capture those special moments. 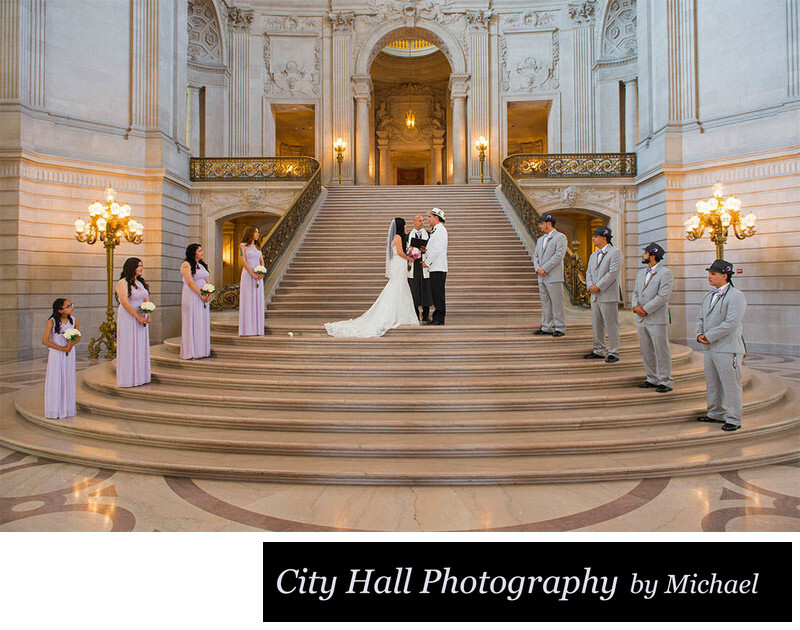 The photo above displays a San Francisco City Hall wedding on a Saturday. Yes, you can rent the entire building on Saturday and have your wedding ceremony in private. No tourists or crowds, just you and your guests. The event staff does restrict access to certain floors and it is a good idea to tell them beforehand where you would like photos taken after the ceremony. Saturday ceremonies can accommodate a very large number of guests unlike week-day weddings. 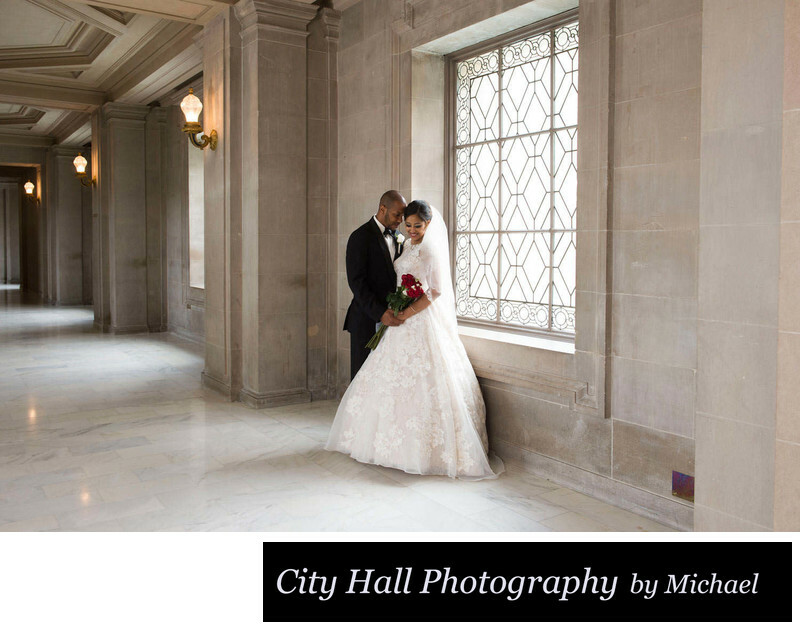 If you would like us to cover your Saturday City Hall wedding, please contact us for special pricing. The Ultimate Romance Package would be one option to consider if you are planning a party afterwards or just want to tour San Francisco. We are happy to discuss these options with you. Just let us know! The truth is, we love taking photos on the 3rd floor of San Francisco City Hall! The light is amazing and can be controlled almost like a studio. Face the couple into the light from the window and you get soft directional light that adds a glow to their faces. Position them so the light is coming in from their side and you can create classic photography studio light. Shoot directly into the window for silhouettes or rim lighted subjects. The ability to accomplish all of this is partially because the light source is on the north side for these windows. Artists understand that northern light is the favored direction. For years, photography studios have attempted to have a north facing window to pose their models close to. Rembrandt was famous for his portraits with northern light illuminating his models. San Francisco City Hall just happens to have a number of windows facing North! Just one more reason we love shooting here! In the photo above, notice how the window light makes this bride's veil glow. This adds another dimension to the image.